In the world of specialty coffee, automatic drip brewers are seldom praised for their quality. Despite being the most popular brewing method in North America, auto drip brewing is widely seen as inferior to French press, espresso, and even pour-over. For many coffee geeks, automatic coffee machines evoke memories of stale, burnt, and under-extracted coffee that is synonymous with sleazy diners and giant café chains. These negative associations are not entirely unfounded. Most automatic drip machines found on the shelf of your local department store are simply incapable of brewing an objectively good cup of coffee. Designed for time-starved caffeine addicts, these brewers invariably sacrifice fidelity for convenience. Subpar brewing technology is iterated over and over again with faster boiling, increased automation, and an endless series of gimmicks. Time and time, the basics of a fantastic brew are neglected. Contrary to the belief of a vocal minority of coffee snobs, there are no fundamental obstacles preventing automatic drip machines from brewing an excellent cup of coffee. Some automatic drip brewers produce a coffee so delicious, in fact, that they have been awarded SCAA’s (Specialty Coffee Association of America) prestigious Home Brew certification. So, what does it take to brew an excellent cup of coffee? 3.0 – How Do Drip Machines Work? 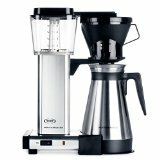 4.0 – How Do I Choose the Best Automatic Drip Coffee Maker? In this article you will find the full list of the best drip coffee maker for 2015. Don’t forget to check out our Top 10 Drip Coffee Makers, Comparison Table and Drip Coffee Maker Reviews. Check out our Top 10 for the Best Drip Coffee Maker! Whether you are using a drip brewer, French press, or even an espresso machine, the quality of your coffee hinges on the same basic factors: great coffee beans, freshness and coarseness of grinds, the correct brewing temperature, uniform grind saturation, coffee-to-water ratio, and ideal extraction percentage. Let’s take a look at each of these in greater detail. 1. Go for Arabica—Robusta beans are bitter and one-dimensional. 2. Try and purchase beans as close to their roasting date as possible. 3. Store your beans is in an airtight container, away from sunlight and heat. For the best cup of coffee, it is important to grind your beans immediately prior to brewing. Volatile flavor chemicals oxidize and degrade in a matter of hours, resulting in stale-tasting coffee. For this reason, pre-ground coffee should be avoided (unless buying bulk packages of stale coffee is your thing). The other important grind consideration is texture; a grind too fine will yield overly bitter coffee, and a grind too coarse will result in a watery, flavorless brew. Each brewing method has its own ideal texture, with French press working best at a coarse consistency similar to steel-cut oats, and espresso requiring a fineness akin to baby powder. For drip machines, a medium, sand-like texture works best. Depending on your strength preference, you can use slightly coarser or finer grinds to brew lighter or bolder coffee, respectively. Flavor scientists and organic chemists have long known that the ideal brewing temperature for coffee rests between 195° F and 205° F—the sweet spot for maximal flavor and minimal degradation. Regardless of bean type, level of grind coarseness, and brewing method, this range stands firm with negligible variation. At an average brewing temperature of 175° F, it is no surprise that most drip machines produce subpar coffee. Coffee brewed at these temperatures comes out stale and flat, entirely devoid of flavor complexity. The bottom line: if you are on the hunt for a fantastic cup of drip coffee, do not compromise on brewing temperature. Note: it is not enough for a drip machine to heat water to this temperature. The only relevant metric is the temperature of the water hitting your grinds, after it has passed through a series of tubes, left the showerhead, and travelled through open air. Although less problematic for methods like French press and Turkish pot, where grinds are completely submerged in water, proper saturation is absolutely vital to espresso and drip brewing. For a truly fantastic cup of coffee, coffee grinds have to be evenly saturated with hot water. Uneven saturation, indicated by clumping, dry spots, and “blooming,” results in under-extraction and over-extraction at the same time—a coffee that tastes both bitter and sour. For a drip brewer, proper saturation is largely dependent on its showerhead; the portion of the machine that sprays hot water over the coffee. Larger, rounder showerheads are typically superior, providing a more uniform coverage of grinds. Other factors include: water pressure, distance between the showerhead and filter basket, and shape of the filter. As anyone who has accidentally under-filled or over-filled a filter can tell you, a proper coffee to water ratio is absolutely essential for an ideal cup of coffee, regardless of brew method. The concept is simple: the more coffee grinds you use in relation to water, the stronger and bolder your batch will end up. The most oft recommended ratio for drip brewing is roughly 2 ounces of coffee for every liter of water, or 1 tablespoon of coffee for 3 ounces of water. Europeans, who like a much bolder cup of coffee, sometimes use a ratio closer to 100 mL of coffee per 600 mL of water. Out of all the factors mentioned in section 2.0, proper coffee extraction is the hardest to pin down. While the ideal coffee extraction lies somewhere between 18% and 22%, it is nearly impossible to determine how this translates to infusion times for drip brewers. A moving target, infusion times are highly variable across machines. Even America’s expert coffee authority, SCAA, cannot pinpoint a specific ideal for steeping times, citing a vague window of 4-8 minutes. Unless you have access to a chemistry lab, or a refractometer lying around in your basement, your only option for gauging extraction levels is by taste; under-extracted coffee will taste flat and sour, while over-extracted coffee will taste bitter and burnt. A proper extraction, on the other hand, should taste rich and sweet, with a balanced hint of bitterness. A relatively new invention in the span of coffee’s long history, drip brewers supplanted the reign of the percolator in the 1970s. Because the percolation method ran boiling water (212° F) through coffee grinds, it resulted in bitter, over-extracted coffee. Recognizing the folly of this method, a German inventor by the name of Gottlob Widmann devised the first drip machine technology. The drip brew process is deceptively simple. First, a water reservoir is filled with cold water, and a filter basket is filled with coffee grinds. As the machine is turned on, water is slowly siphoned through a one-way valve at the bottom of the reservoir, traveling through a resistive coil. As the coil boils the water, it rises up a tube towards the showerhead, where it is drips onto the coffee grinds. Once the grinds have been thoroughly saturated, the continuing drip of the showerhead forces extracted coffee out of the filter, into a carafe. Because the boiled water runs through a tube and falls through open air before contacting the grinds, it has plenty of time to cool below 212° F, preventing the over-extraction that plagued percolators. Unfortunately, in most cases, the water loses too much heat, and the coffee is left under-extracted. Hitting the middle ground is one of the biggest challenges to engineering a drip machine, and it is a goal that few have met. It is, nevertheless, possible with artful engineering and careful planning. To gain a deeper understanding of what distinguishes subpar brewers from technically excellent ones, we will explore each vital component in greater detail. Typically made from plastic, a drip machine’s water reservoir is one of its most overlooked features. While variation in reservoir designs has a negligible effect on the actual brewing process, it has far-reaching consequences on convenience. Small, awkwardly placed reservoirs are hard to fill, and are the cause of many spills. The ideal reservoir is removable, lightweight, and sturdy. Typically made of aluminum or copper, a drip brewer’s heating element is nothing more than a resistive coil. In layman’s terms, it is a piece of wrapped wire that heats up when electricity runs through it. Determined by the length, gauge (thickness), and material, resistance is one measure of a coil’s performance. A lower resistance coil requires less power and heats up faster, but is more likely to burnout in the long run. The other measure of performance is the coil’s heat distribution. Indirectly linked to resistance, heat distribution is determined by the shape, size, and the orientation of a coil’s positive/negative connection points. Ideally, the coil will heat outwards from the center, ensuring a consistent and equal heat source for the water. If the coil heats from the outside in, it will develop hot spots (areas of the element that disparately high temperatures), yielding inconsistencies in boil rate and water pressure. This negatively impacts everything from saturation to brew temperature. One of the most important factors in ensuring proper brew temperature; a drip machine’s tubing should be insulated and heat retentive. Cheaper, plastic tubing is often the culprit in subpar brewing temperatures, cooling the boiled water significantly before it reaches the grinds. Nearly all high-end machines use a variation of high-fidelity glass for their tubing, ensuring maximum heat retention. As the water’s final stop before hitting the coffee, showerheads play an important role in the drip brewing process. Low-end showerheads, typically resembling faucet openings, dribble water chaotically and haphazardly, often resulting in uneven extraction. Large, round showerheads, typically found on higher-end devices, disperse water more uniformly throughout the grinds, ensuring an even extraction. Beyond proper water distribution, showerhead material, size, shape, and placement also have a small impact on brewing temperature. A cheap material will retain less heat; a poorly shaped showerhead will slow water down, giving it more time to cool; and a showerhead placed too far from the filter can cause the water temperature to drop several degrees, as the water has to travel a longer distance in open air. As the water’s last stop on its transformative journey into coffee, the filter basket plays a vital role in the drip brewing process. Despite (or perhaps because) of their importance, filters are a point of much debate in the world of specialty coffee. Some prefer flat-bottomed filters, while others use only cone filters. Americans swear by disposable paper filters, only using permanent filters as a measure of last resort. In Europe, where paper filters are scarcely available, coffee drinkers have grown to prefer the gritty and rich coffee produced by permanent gold tone filters. While there is no real consensus about filter material, many coffee connoisseurs agree with the Europeans, citing the long-standing belief that paper filters trap flavorful coffee oils. While technically true, this effect is grossly overstated; even though paper filters do trap some of the flavor oils, the difference in taste is negligible. Furthermore, as taste tests conducted across the globe indicate, coffee drinkers tend to prefer the flavor they are most familiar with—Americans prefer paper, Europeans prefer gold. As far as filter shapes go, a consensus is not necessary. The ideal filter shape is entirely dependent on the showerhead it is used with. For example, showerheads reaching a smaller surface area of grinds are often coupled with cone filters. This is not a strict rule, however. With thousands of variations in coffee maker designs, there are bound to be more exceptions than rules. Nevertheless, finding an ideal filter shape and size for your machine is absolutely vital to even saturation and proper extraction. Now that you understand the basics of coffee brewing and the nuances of drip coffee makers, you are ready to start shopping. Depending on your price range and coffee drinking preferences, you won’t necessarily need a machine with the most glowing reviews or prestigious certifications. Even if you are looking for a high-performance brewer, you might have a strict budget. You should also decide if you want your coffee maker to have extensive programming features or a built-in grinder. Taking this into account, we have broken up your choices by price range: low-end, mid-range, and high-end. The general consensus amongst experts and coffee casuals alike is that you should avoid drip machines in this range. Even if you have no intention of brewing the best coffee in the world, the headache of a low-end coffee maker is simply not worth your money. Machines in this range fail every vital benchmark for good coffee. They brew far below the optimal temperature of 205° F, often struggling to hit even 170° F. They are incapable of evenly saturating your grinds, and often use nothing more than a dribbling, single holed nozzle for water dispersion. Worst of all, abysmal build quality is universal to this product range, with thousands upon thousands of customers complaining about non-stop leakage, buttons that fall off after repeated use, and outright machine failure. If you are desperate for coffee, and absolutely broke, just buy the cheapest machine you could find. But if you want consistency, convenience, or quality, you should start saving your pennies. Recommended read: The Top 5 of Best Coffee Makers under $100. For most coffee drinkers, this range tends to be the sweet spot for serviceable coffee makers. If you are looking for an automatic drip machine that can brew a decent cup of coffee without breaking the bank, you should stick to this price range. Be wary, however. Dominated by multi-billion dollar appliance manufacturers like Hamilton Beach, Krups, Cuisinart, and Mr. Coffee, the mid-range segment of brewers is rife with snake oil. A notable example of the aforementioned snake oil is “strength control.” As described in 2.0 – The Basics of a Fantastic Brew (jump back), the only factors that determine boldness are: 1. Grind coarseness, and 2. Coffee-to-water ratio. The “bold” setting on mid-range brewers has no impact on either; it merely extends the machine’s brew cycle, resulting in a bitter, flat, and over-extracted brew. As such, stick to the basics: temperature, grind saturation, and extraction. Only after the basic benchmarks have been sufficiently met should you look at peripheral features. Even then, the only meaningful peripheral feature in the mid-range is programmability. Only one machine in this price range meets all three benchmarks: Zojirushi’s Zutto (read our review). Technically a high-end machine, this fantastic 5-cup brewer sells at a mid-range price. Brewing at 205° F, saturating grinds evenly, and achieving ideal extraction, the Zutto makes some of the most delicious coffee you may ever have the fortune of trying. As for peripheral features: the Zutto lacks programmability, but includes a heating plate. After Zojirushi, Cuisinart machines come closest to hitting the benchmarks. While they all fall short of the temperature goal (capping out 190° F), their round showerhead designs provide excellent grind saturation. As a bonus, every one of them can be programmed. Notable offerings include: the DCC-2600 (review), DCC-2650 (review), and the DCC-3000 (review). Easily the best value of the three, Cuisinart’s DCC-2600 offers full programmability, a hot plate, a large brew quantity (14-cups), and a high quality build—all for $70. For $80, you can purchase the Hamilton Beach 2-Way Coffee Maker (review). While it fails to hit the benchmarks and suffers from build issues, it is nevertheless one of the best values in its price range. Its standout feature, 2-Way brewing, is easily mistaken for a gimmick. This can be attributed to the buzzword-saturated marketing. The 2-Way Coffee Maker is actually two brewers in a single enclosure—one batch brewer, and one single serve brewer (a la Keurig). Purchasing the two separately would cost upwards of $150. Thus, if you are content with decent coffee, and see yourself purchasing a single-serve brewer down the line, Hamilton Beach’s 2-Way Coffee Maker is an absolute steal. Given the incredible variety of products in this price range, there are potentially dozens of other brewers that may fit your bill. Some potential candidates include Bunn, KitchenAid, Mr. Coffee, and Capresso. Just remember, stick to the basics. Also, check out our list of the best coffee maker under $100. Recommended read: The Top 5 of High End Coffee Makers. If you won’t be satisfied with “decent,” and yearn for “fantastic,” you’re going to have to spend a little more; the best coffee makers sell for no cheaper than $150. On the bright side, you won’t have to spend much more than that to brew a truly fantastic cup of coffee. On the lower end of this category, you will find a wide variety of machines by KRUPS, DeLonghi, and Bonavita. With the exception of Bonavita, most of these brewers are gimmicky mid-range performers, failing to satisfy the basics requirements of a fantastic coffee brewer; all flash and no substance. Bonavita machines, on the other hand, boast incredible performance. They brew at a controlled 200° – 205° F, use round showerheads for even grinds saturation, and achieve a perfect extraction, every time. The most oft recommended Bonavita machine is the BV1800 (review), which will set you back roughly $150. The slightly pricier BV1800SS (review) is also a fantastic choice, as it includes an excellent heat retentive stainless steel carafe. Both machines brew fantastic coffee consistently. Unfortunately, neither offers programmability. Going a little higher in price (~$200), you will find machines by Capresso, Breville, Cuisinart, and Behmor. Once again, the majority of these brewers are middling performers with pretty designs and unnecessary features. Interestingly enough, the machine sporting the most gimmicky appearance, Behmor’s Brazen Plus (review), boasts the best performance of the bunch—perhaps the best performance period. Not only does the Brazen Plus easily meet every benchmark (temperature, saturation, extraction), it also has the best feature-list of any high-end brewer available. It offers full programmability, manual calibration, and can double as an ultra-precise hot-water dispenser. Most importantly, it is the only coffee brewer on the market with variable temperature control. Read our review for a full explanation of why this is such a revolutionary feature. Put simply, Behmor’s Brazen Plus is the most powerful, consistent, and convenient high-end brewer available. At $200, it is a steal and that’s why it’s #1 on our Drip Coffee Maker Top 10. The $300 range is dominated by reigning champion of home brewers, Technivorm. For decades, coffee experts have recognized Technivorm machines as the epitome of drip brewing technology. Sticking to the bare basics (temperature, saturation, extraction), Technivorm brewers offer no peripheral features, least of all gimmicks. Technivorm’s flagship brewer, the Moccamaster (review), boasts such technical excellence, that its design has remained unchanged since the 1970s. While it may seem expensive, $300 is a small price to pay for perfection and beauty.. The Bonavita BV1900TS is an excellent competitor for the Technivorm though, which is why we put them in a battle. Above $500, you begin to see commercial batch brewers from the likes of Bunn, Newco, Melitta, DeLonghi, and Bloomfield. While most of these machines brew excellent coffee, they are not suitable for home use; these bulky, unattractive drip brewers belong behind the counter of a café. We hope this article has given you enough background to choose a drip machine that suits your needs. If you’re interested in learning more, feel free to check out our Top 10 list, reviews section and comparison table. All coffee lovers have looked into the best programmable coffee maker available, at least once in their lives. Why? Because we know that good coffee can sometimes require more time than we have. Some mornings, we’re too busy to grind, presoak and brew. This blog compares and reviews drip coffee makers. While our opinions of a product are based on thorough research along with personal experiences, we do receive a commission each time a product is purchased through one of our links. The amount is the commission isn't of any influence to the actual rating of a product. Let's Drip Some Coffee is a participant in the Amazon Services LLC Associates Program, an affiliate advertising program designed to provide a means for sites to earn advertising fees by advertising and linking to amazon.com. Amazon and the Amazon logo are trademarks of Amazon.com, Inc. or its affiliates.